In the days leading up to E3, Square Enix has tossed us yet another tantalizing teaser of a video for the upcoming Kingdom Hearts III. This latest clip shows just how much work the developers are squeezing into this title; another video is expected on July 15th, 2017 during D23 Expo 2017, including a peek at a new world. 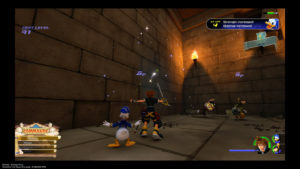 Sora dives into Olympus from the movie Hercules and instantly engages swarms of heartless, being able to lock on to multiple enemies and unleash a devastating attack. The battle with Lythos, the colossal rock titan, takes place under pouring rain where the water flows down the sheer cliffs akin to tears of joy. The graphics have gotten smoother, looking almost cinematic where the characters in the cut scenes are in focus while the backgrounds are softened. The user interface remains the same as in previous games, utilizing minimalism styles to focus on the action. Unsurprisingly, a release date for Kingdom Hearts III was not mentioned in the video.